Here is one for your page. It is the Pythian Home, located in Weatherford, Texas. 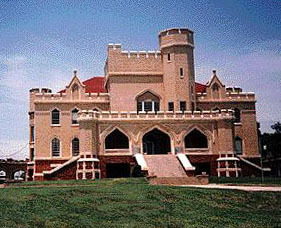 In Weatherford, Texas (20 miles W. of Fort Worth stands the majestic old 93 yr. old castle owned by the Texas Pythians (like the Masons). It is a real castle with deep basement for coolness and houses abandoned children for all these years. The children are not adopted out, and remain there until they are 18 or complete college if they want. My Mother worked there for years, and the old castle really has it's own guests as well. They take wonderful care of these children. Just wanted people to know. I'm not sure this is a castle, but it does have a castle look to it. My husband grew up there. He was the youngest of 6 children who went to the home in 1950. He was only 4 years old. He lived there until he was 20. They used to have a school on site for grades 1-5. Miss Gracie was the teacher on the one room school. My husband went through all 5 grades before going to "town" school. When he was in the 4th grade he was the only student in that grade. They use to have dairy cows, pigs, a peach orchard and huge gardens. They raised almost all the food they needed plus were able to sell some. As a senior in high school he played football and was in charge of 400 hogs. 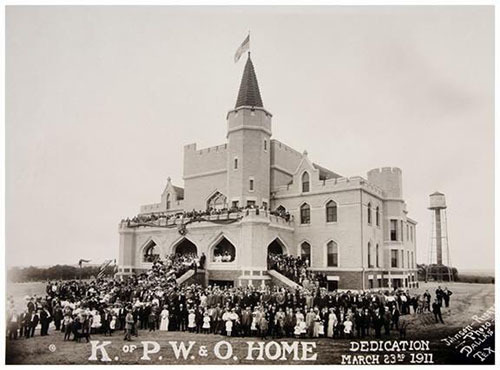 I have lived next to the pythian home since i was 3 years old waking up everyday and seeing it outside my window, and I have to say it really is a castle it dosent just "have a castle look" it dominates the landscape as a castle should its really and impressive sight. This castle definitely fits the term castle. I had the pleasure of visiting this place when my branch of the Society for Creative Anachronism held our Yule Revel there. There were a multitude of little rooms and corridors. Lofty ceilings, hardwood floors and sturdy 19th or VERY early 20th century construction. On the upper floor there is a large main hall with a beautiful carved crown molding and raised dais. It truly transported our Yule Revel to a fairy tale place of mind. The large windows and heavy curtains of this Great Hall made our banners and pennants and blend in like no other hall we have had the privileged to use. 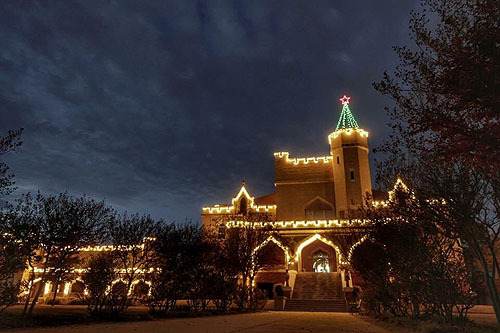 Until just a few years ago the Pythian Castle was also a working farm. The school still exists. Out behind the castle is the small private cemetery for those who have passed away there. When you think of the mission of the people of this Castle there is no other castle in America I can think of which instills such a great feeling of chivalry, honor and duty in the hearts of those who have had the privilege to visit. God Bless the Pythian Home Castle and its Residents. My Name is Barry Horton. I lived at the Texas Pythian Home from 1971 to 1979. I moved there with my two sisters and one older brother when I was 13. It really is a castle. The main building in the center has 3 Stories. The lower level is essentially underground and stays cool. There is a large laundry down there, some rooms for storage and some staff apartments. The Main floor is administration, dinning and the Administrators quarters. There is a beautiful library also. The upper floor has more storage rooms and a theater. When I was there I was in charge of the pigs. I also woke up every morning and we had about 60 milk cows which we milked twice a day. We had horses, pigs, sheep, chickens and a very large garden not far from the main site. We also had 3 different properties located within 5 miles of the home that we used as our garden, orchard, and hay fields. We were truly self sufficient. I have a lot of good memories of the castle on the hill. During my stay there were about 30 boys and 30 girls and I have kept in touch with a few of them till this day. I owe my success to the loving staff of the Pythian Home who helped mold me and give me dignity and strength to be able to go out into the world with confidence. Some might say it must be awful to have had to live in an orphans home. Actually it was one of the best experiences of my life and I would not have traded it for anything. I had 60 brothers and sisters and people who really cared. If anyone is interested in learning more they may contact me via email at" barry.horton@pceeverett.com". I was raised here from 1990-2000, my parents were boys dorm parents and we had 8 boys at all times. The children who come here are not abandoned, their families have an issue and it prevents them from being able to take care of the children so they place them with us until they can get back on their feet and take their children back full time. My grandfather was placed here in 1936 and left in 1947. It has a very special place in my heart. I have attached photos of the castle and hope you update the page with them. Thanks to Lydia Osborne for finding this castle.